Canada is truly a blessed country. Its got natural wonders like the Grosse Morne National Park in Newfoundland, and the incredible rainforests of Vancouver Island. Its the only G8 country that hasnt had to bail out its banks. Everyone in Canada has healthcare, and the country owns hockey. And as if all that werent enough, Canada is also a world leader in loudspeaker design and production. Whats in the water up there? With the Canadian speaker industry dominated by such benchmark brands as Paradigm and PSB, its got to be tough to break into the market. Whats even harder is building a reputation as an honest-to-goodness competitor of those seminal brands. Despite the obstacles, some smaller companies have managed the feat; from Axiom to Verity Audio, theres a plethora of smaller speaker makers in the Great White North, and among the best known of these is Focus Audio. 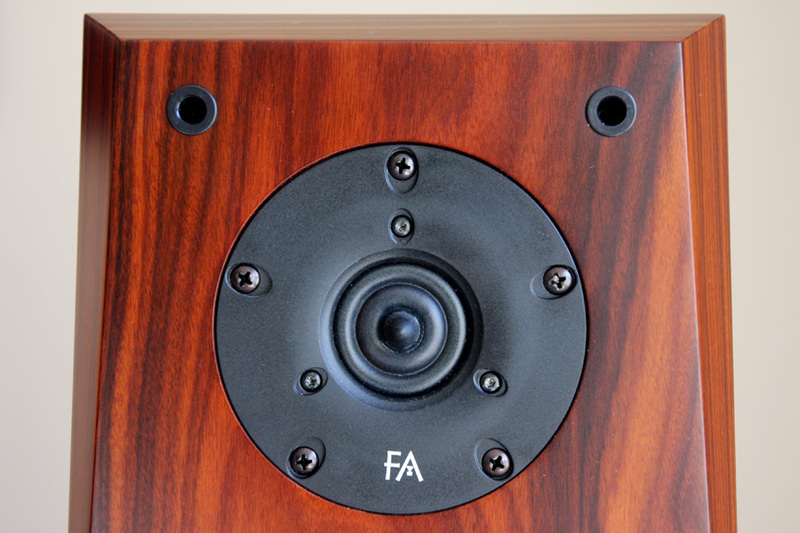 Located just outside the metropolis of Toronto, Ontario, Focus Audio has earned a reputation for producing high-quality speakers that feature exquisite finishes of wood veneer. In the pages of the SoundStage! Network, Focus has easily won over the likes of Doug Schneider and Wes Phillips, who both wholeheartedly agreed that Focus speakers are worth the sometimes substantial prices they command. Imagine, then, the interest at GoodSound! when Focus asked if wed be interested in listening to their new Classic line of value-priced speakers. As Wes said in the Conclusion of his review of the FS888, when it comes to being offered a speaker from Focus Audio, the only answer is Bring it on! Focus Audios FC 7 ($1400 USD per pair) uses a cabinet built of 1"-thick MDF on the sides and back, and a whopping 2"-thick baffle. Each FC 7 measures 38"H x 8"W x 10"D and weighs 48 pounds. This two-way design uses a 1" ring-radiator tweeter and a 7" Nomex-coned long-throw woofer made by a "renowned Danish driver manufacturer to Focus Audios exacting specifications." The Classic lines drivers are tested at the Focus factory to ensure theyre within spec, and are then matched with crossovers. Driver/crossover matching for a $1400/pair speaker? Now thats impressive. The claimed frequency response is 35Hz-25kHz, ?dB, the sensitivity 86dB/W/m, the impedance 8 ohms, and the recommended amplifier power 20-300W. As are its four Classic siblings, the FC 7 is clad in a high-quality veneer of real rosewood. Each pair is bookend matched, meaning that the two speakers patterns of wood grain are complementary. The veneer gives the FC 7 an impressive visual presence; everyone who saw the pair of them in my listening room said they loved the look. Even my speaker-jaded missus was pleased to have the FC 7s on display. Their very high level of fitnfinish wouldnt be out of place on speakers costing thousands more. Of course, a great finish on an ugly shape is darn near pointless, and Focus Audio has ensured that the FC 7s profile enhances the speakers visual impact. Though the cabinet is assembled from several pieces, it looks as if carved from a single block of wood. The bevels cut into the sides of the upper third of the front baffle are mirrored on the bottom third to give the FC 7 a modern look when viewed from the three-quarter position; dead on, they create the illusion of the speakers center section appearing to have something of a belly! But the facets arent there only for looks; they serve an important function in shaping the tweeters radiation pattern in two ways. With a smaller baffle area, dispersion can be improved, which means that the tweeters output can radiate more evenly over a wider arc. In addition, the bevels reduce the deleterious effects of diffraction. The FC 7s plinth is permanently affixed to its base and comes with very sharp spikes, but no feet suitable for wood floors. When I rapped a side panel, I discovered that the crack of knuckles on veneer noticeably sharpened about 12" above the plinth, indicating that, down there, the cabinet is completely solid and very heavily braced. Whatever the case, this feature ensures that the FC 7 remains planted to the floor; there seems little chance that the speaker could topple over. It also makes for a very inert cabinet. See our Focus Classic FC 7 photo gallery. The Focus FC 7s were driven by my Simaudio Moon i5.3 integrated amplifier. As usual, my laptop full of uncompressed WAV music files served as the digital source, with a Benchmark DAC1 Pre converting from USB to analog. Connecting the computer and the Benchmark was a Synergistic Research Tesla Tricon USB cable; Supras Ply 3.4/S speaker cables were strung between the i5.3 and the FC 7s. The FC 7s projected a very wide soundstage. For the first month I had them, I toed them in to fire directly at my listening position -- they sounded good but not great. Then I attended the 2009 Consumer Electronics Show and saw that Focus Audio was demonstrating the FC 7s big brother, the FC 9, with almost no toe-in at all. In fact, the FC 9s baffles were nearly parallel to the rooms front wall. This positioning had an incredible effect on treble dispersion -- the 9s sounded so much more open than the 7s, which Id obviously positioned incorrectly. And despite the fact that, at CES, I sat way outside what youd normally expect to be any pair of speakers "sweet spot," the imaging was incredible. Sitting beside me, the SoundStage! Networks Roger Kanno remarked that "these things image like crazy!" But the FC 9s didnt exaggerate the soundstage, didnt smear, and didnt misplace instruments or vocals. I couldnt wait to get home to reposition the FC 7s. That done, I sat back and was immediately bathed in the same wondrous soundfield Id heard in Las Vegas from the FC 9s. The improvement was enormous -- the FC 7s now sounded like completely different speakers, and quickly became addictive. I spent more time in front of the FC 7s than I have with any speaker Ive reviewed since the Exodus Audio Kepler. Its a great thing when a reviewer has to force himself to go to bed. The FC 7s treatment of some of my favorite music was responsible for many lost hours of sleep. Brian Lynch Meets Bill Charlap (CD, Sharp Nine 1027-2) was an excellent tool for assessing the Focus, especially its tweeter. Take, for example, "On Green Dolphin Street," which features Lynchs piercing muted trumpet and the steady pulse of Joe Farnsworths ride cymbal. On this track Lynch puts a lot of power behind his loudest, highest notes, and because of this, the recording can be hard to bear through speakers that lean toward the bright side of the street. The FC 7 was not one of them. Its ring-radiator tweeter excelled at offering bucketsful of the qualities I love to hear in a tweeter: it was liquid, detailed, and crisp. On the other hand, that tweeter had none of the traits that can ruin high-frequency reproduction, for it never sounded etched, grating, or hot -- even when I threw at the FC 7s the brightest recordings I own. I recently received a copy of Mariah Parkers Sangria (CD, Ancient-Future.com 2017), a disc I didnt think Id like but that quickly became a favorite. Who knew that Indo-Latin jazz fusion could be so entertaining? The album opens with "Waterwheel," which showed how well the FC 7s could image. With eight performers playing an eclectic mixture of tabla, scalloped fretboard guitar, bansuri (an "alto transverse Indian flute"), bowed bass, and piano, the FC 7s were given a lot to manage. The track opens with a reaping piano phrase at center stage, as a series of other instruments join from various points in space. First, the string bass moans in the foreground. Then, on the far left, sleigh bells provide some accents, while the bansuri provides punctuation up front on the right. All these are backstopped by the tabla, which is more prominent at the right but is also present a little way into the left of the soundstage. Yes, the FC 7s made it very easy to follow each instrument independently, but also did a marvelous job of bringing these disparate elements into an intoxicating, satisfying whole. Of course, the tweeter is only half the FC 7s driver complement. A 7" woofer might be considered on the large size these days, but it proved just the ticket for going low. The FC 7 definitely went into the mid- to low-40Hz area with no trouble at all, as evinced by the string bass in "Waterwheel," which sounded as full and rich and throaty as an angry bull. Actually, nothing I threw at the woofer seemed to push it to its limits, so I have little trouble believing it has significant output into the high- to mid-30Hz area. Still, that single woofer was responsible for the FC 7s only real problem. In the pivotal middle frequencies, I found the FC 7 tough to critique. Male and female voices were natural and uncolored. There were a few times, however, when I suspect the crossover point (or my room) got in the way of some midrange performance. This was manifest in a momentary narrowing of the soundstage, and by my sense that the sound was emerging from the baffles, from between the two drivers. This happened only with certain recordings, most notably early ones by Harry Connick, Jr. More modern recordings -- by, for example, Michael Bubl? Tony Bennett, and Paul Anka -- exhibited none of this midrange anomaly. Generally speaking, a single large woofer wont sound as "fast" as two smaller woofers working in tandem. This was the case with the FC 7, at least in comparison with Paradigms all-new Studio 60 v.5 ($1998/pair). The FC 7s 7" woofer offered terrific performance and went plenty deep, but it was just a hair slower than the Studio 60s twin 5" drivers. This was evident when, for example, I listened to Ray Browns acoustic bass, which tended to sound a bit loose and flabby. Kick-drums, too, could have been tighter. This was by no means a serious problem, but one that bears noting. The Paradigm and Focus speakers were quite different in the ways they reproduced treble. What was interesting was that both tweeters were very neutral, yet sounded quite different. The Paradigms G-PAL aluminum tweeter was more aggressive, and excelled, for example, at capturing the attack energy of a drumstick striking a ride cymbal. The FC 7s strengths were more in the shimmer and decay of said cymbal. For the midrange, the FC 7 is up against a dedicated driver in the Studio 60 v.5, so its not much of a contest in that department. The Studio 60 remained even-keeled no matter what I threw at it, and in the mids was clearly superior to the FC 7. Of course, with a purpose-built driver and a $600 premium, its only fair to expect that the Paradigm would come out on top. The Focus Audio FC 7 is a great speaker and a great bargain. For just $1400, a pair of FC 7s offers deep bass, outstanding soundstaging, and a spaciousness that makes an airplane hangar seem confining. Nor does it hurt that the speakers look like a million bucks, and offer fitnfinish on a level above their price. It was a real treat to have the FC 7s in my listening room for several months; if I werent packing and moving, Id be sorely tempted to keep them. These intoxicating loudspeakers will keep many listeners up way past their bedtimes; though the resulting lack of sleep might shorten lives, FC 7 owners will at least die happy.